Yamaha worked with Redlion to help recommend and development a native driver set that would communicate with Redlion HMIs to an RCX40, RCX141, RCX142, RCX143, RCX144, RCX221, RCX222 and RCX240 series controllers. **WARNING** - (this Red Lion driver DOES NOT WORK with an RCX340 controller). 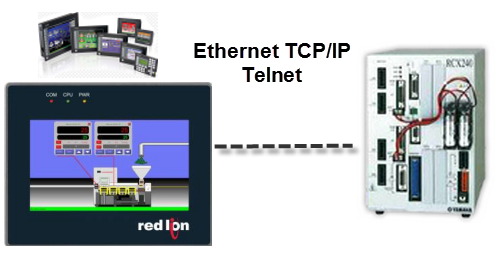 The HMI can be used directly without using a PLC as a gateway. An Ethernet TCP/IP telnet card or RS-232 port on the RCX controller is used to directly communicate to a Yamaha robot controller.